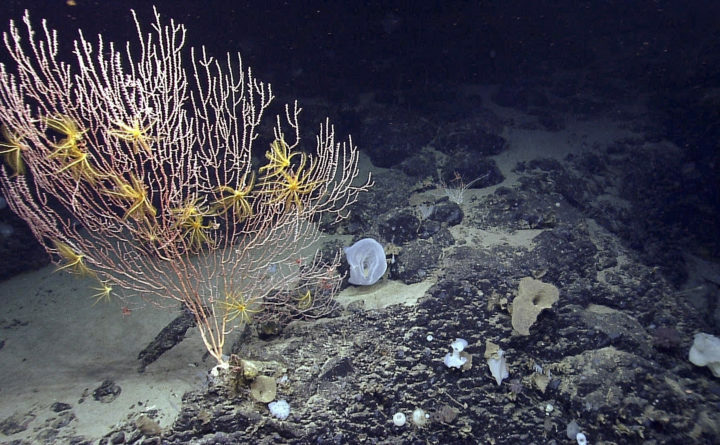 This 2013 file photo released by the National Oceanic and Atmospheric Administration made during the Northeast U.S. Canyons Expedition, shows corals on Mytilus Seamount off the coast of New England in the North Atlantic Ocean. The Northeast Canyons and Seamounts Marine National Monument was created by President Barack Obama in 2016. Two years ago, a portion of the ocean off the coast of New England was declared a marine national monument, the first in the Atlantic Ocean. Since then federal scientists have been assessing the corals and hundreds of other marine species that live in the conserved area. But the protected area remains under threat as the Trump administration has recommended opening it to commercial fishing. This is unnecessary and will undermine the monument designation. Shortly after he assumed office, President Donald Trump ordered a review of 27 recently designated national monuments, including the Northeast Canyons and Seamounts National Monument off the coast of Massachusetts. The monument, created in September 2016, is one of three marine monuments that were part of the review, which also included the new Katahdin Woods and Waters National Monument in Maine. Five months later, Interior Secretary Ryan Zinke offered a vague report that called for the shrinking of four monuments in the western U.S. and for management plan changes at 10 monuments to emphasize “traditional uses” such as logging, farming, mining and commercial fishing at marine monuments. Those activities are typically restricted on national monument lands. Zinke left the Maine monument intact but called for “active timber management,” which he did not define. He recommended shrinking two Pacific marine monuments and allowing commercial fishing there. He also said that commercial fishing should be allowed in the Canyons and Seamounts Monument, despite the fact that disallowing most fishing — harvesting of lobsters and crabs will continue to be allowed for seven years from the September 2016 monument designation — will have only a negligible impact on the area’s fishermen. Recently revealed documents show that Trump’s Department of Interior had only one metric in mind when it reviewed the monuments — how much could they be worth if they were stripped of trees, opened to more grazing and minerals, oil and gas extracted from beneath them or fish harvested from them. In this review, monuments were not special places meant to be preserved. Instead, they were seen as a source of money from what could be extracted from them. The documents show, for example, that a member of the review team suggested removing language from a memo that showed that commercial fishing vessels caught less than 5 percent of their landings from areas within the Northeast Canyons and Seamounts National Monument. The information “undercut the case for the commercial fishing closure being harmful,” the member wrote. Trying to hide such information is wrong. But it also shows that the Trump administration’s efforts to shrink monuments and to undermine their protections is based on cherry-picked information and analysis meant to confirm a view that preserving natural resources and landscapes is a bad thing. While monuments and national parks on land are mostly about preserving important landscapes that people will visit, marine monuments are about preservation and scientific research. With many fish stocks at low numbers, despite increasing fishing restrictions, and oceans rapidly warming, understanding what is happening underwater is more important than ever. The protected area contains three underwater canyons, one of them deeper than the Grand Canyon, and four underwater mountains that were volcanoes. It is home to diverse wildlife, including corals not found anywhere else. Scientists recently discovered that Atlantic puffins use it as a wintering area. The combination of deep sea and tall mountains provides a breeding and nursing ground for an array of sea life, including lobsters. As the oceans warm — the nearby Gulf of Maine is warming faster than 99 percent of the world’s oceans — research in the monument area can play an important role in crafting policies to address climate change and overfishing. The canyons and seamounts were worthy of protection two years ago and they remain so today.